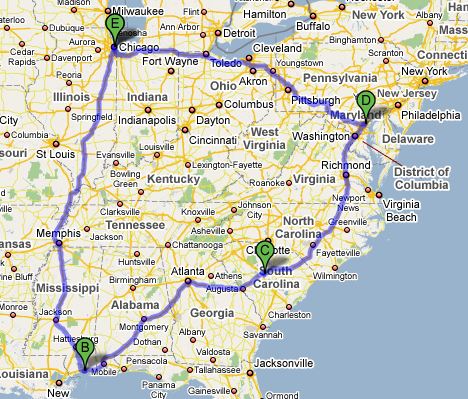 We got back last weekend from our big, three-vacations-in-one, roadtrip around the Southeast. Erica did a great job blogging from the road (start here and keep going until you get to the slippers), and she even compiled a list of every meal we ate. I've put up a Flickr set of almost 300 photos and 9 videos. Documentation overkill, perhaps, but since it really was three vacations in one, that's just a hundred pictures and three videos per. I keep saying three-vacations-in-one, so I'll summarize: Biloxi, MS for Chad and Elizabeth's wedding, which Erica performed; Columbia, SC to congratulate Christopher on his new Master's and see his and Katie's new house; Baltimore and DC for touristing and eating. It was an incredible, and surprisingly relaxing (for a 2,700 mile roadtrip), time. It took me 5 or 6 days to really let go of work worries and trust that my out-of-office voicemail and email messages would direct people to the appropriate coworker and that they really could handle things in my absence. I'll be interested to see if next trip I can get into that space more quickly or if I always need to be on the road a week before I can just relax. I hope it's the former, but I guess it wouldn't be terrible to take longer trips anyway.